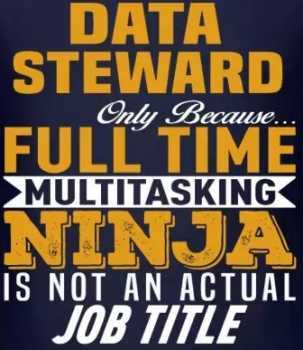 Nobody should be a Data Steward! Kind of an ironic statement from a data management site with a particular focus on data governance. A salesperson captures new leads, creates quotes, updates contact information and so on. If he does his job properly, the data is captured correctly and the organisation has an accurate record of the customer. He is acting a steward of the customer information. A Database Administrator is asked to develop a routine SQL script to extract data from source A and copy it to source B. before he agrees he asked for a Issue to be logged and approved through the company Data Helpdesk. Without realizing it he is performing a stewardship function. A Business Analyst works with the Marketing Manager to define the reporting specification for the new campaign that will be running next quarter. Another stewardship function! Data stewardship is a fundamental capability of data governance. It is not a job title. In the post Data governance must disappear, I spoke about the need for data stewardship tasks to be recognized for the day to day routine activities that they are. As described on the T-shirt above (from spreadshirt.com ) is a role that is too big for any one person. July 31, 2018 in Data Quality.